TOPEKA – The Kansas Department of Health and Environment rescinded a boil water advisory today, Aug. 23, 2018, for 10 of the purchasing systems of Public Wholesale Water Supply District No. 12. The advisory was issued Monday because of a line break resulting in a loss of pressure in the system. Failure to maintain adequate pressure may result in a loss of chlorine residuals and bacterial contamination. The order has been lifted for the cities of Lyndon and Quenemo in Osage County, along with Osage County Rural Water District No. 4, Anderson County RWD No. 4, Coffey County RWD No. 3, Melvern Lake Arrow Rock Campground, and the cities of Lebo, Waverly, Williamsburg and Pomona. The boil water advisory remains in effect for the city of Melvern, in Osage County, because of a positive bacteriological sample. Additional sampling must be conducted. Laboratory testing samples collected from Public Wholesale Water Supply District No. 12 and the purchasing systems listed above indicate no evidence of contamination, and all other conditions that placed the system at risk of contamination are deemed by KDHE officials to be resolved. TOPEKA, Kan. – The Kansas Department of Health and Environment issued a boil water advisory today for 12 water systems in northeast Kansas, including the Osage County communities of Lyndon, Quenemo and Melvern. The water systems obtain water from Public Wholesale Water Supply District No. 12, which was put under the advisory because of a line break resulting in a loss of pressure in the system. The water systems affected include those of the city of Lebo, city of Quenemo, Coffey County Rural Water District No. 3, city of Lyndon, city of Waverly, Osage Co. RWD No. 4, city of Melvern, city of Williamsburg, Osage Co. RWD No. 6, city of Pomona, Anderson Co. RWD No. 4, and Melvern Lake Arrow Rock campground. Water used for bathing does not generally need to be boiled. Supervision of children is necessary while bathing so that water is not ingested. Persons with cuts or severe rashes may wish to consult their physicians. If your tap water appears dirty, flush the water lines by letting the water run until it clears. The advisory took effect Monday, Aug. 20, 2018, and will remain in effect until the conditions that placed the system at risk of bacterial contamination are resolved. With Osage County and portions of Kansas under a state-issued drought emergency declaration, the federal government has authorized emergency grazing of some of the state’s Conservation Reserve Program acres. The governor had earlier authorized use of state lakes for water sources for counties designated in a drought emergency. U.S. Department of Agriculture Farm Service Agency announced today additional authorization of Conservation Reserve Program acres for emergency grazing for 44 counties in Kansas, including Osage County. Earlier in the month, Kansas Governor Jeff Colyer issued a drought declaration for the state, which included all 105 counties in drought emergency, warning or watch status; 50 counties are in emergency status. The declaration allows individuals and communities in counties in emergency stage to be eligible for use of water from certain state fishing lakes and some federal reservoirs. Anyone needing water from the designated lakes must contact Kansas Water Office for a water supply request prior to any withdrawals. Likewise, eligible producers interested in emergency grazing of CRP must request approval through their local FSA before grazing eligible acreage, and obtain a modified conservation plan from the NRCS that includes grazing provisions. The governor’s declaration is in effect until rescinded by executive order; emergency grazing of CRP is authorized through Sept. 30, 2018. Officials cited livestock water shortages, low flows at some reservoirs, and outlook of persistent drought as reasons for the statewide drought declaration. Some areas of Kansas are behind more than 15 inches in moisture for the year, and outlooks indicate continuing above normal temperatures and below normal precipitation. MELVERN, Kan. – Two people were killed in a rollover accident on Interstate 35 in Osage County Saturday evening, following a pursuit by a Lyon County sheriff’s officer. According to a Lyon County Sheriff’s Office press release, about 8 p.m. July 7, 2018, a deputy attempted to stop a vehicle at mile marker 142 on I-35. The driver of the 2007 Chrysler PT Cruiser, later identified as Sharnicca D. Cannon, 23, of Tucson, Ariz., refused to stop and a pursuit ensued, heading northbound on the interstate. During the pursuit, it was learned the vehicle had recently been reported stolen during a robbery in Emporia, Kan. The sheriff’s office reported the driver attempted to exit at a high rate of speed at the Melvern, Kan., exit, at mile marker 160, when the driver lost control, and the vehicle left the roadway and rolled several times. 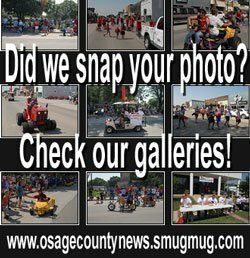 Coffey County EMS, Osage County EMS, and a Life Team helicopter responded to the scene, but lifesaving measures were unsuccessful. Cannon and the passenger in the car, Anthony E. Krawczyk, 20, Mesa, Ariz., were pronounced dead at the scene. Both victims were wearing seatbelts at the time of the accident. The crash is under investigation by the Kansas Highway Patrol. 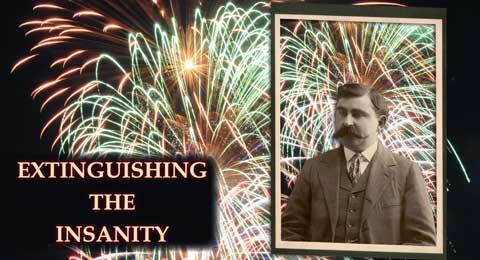 In the early 1910s, commissioners at Kansas City, Kansas, started pushing for a sane Fourth of July celebration. Up to this time regulations were very limited. Fire related deaths had been reported as 4,500 in 1903, but with increasing fire awareness had dropped to 1,500 in 1914. Kansas City’s “Sane Fourth” model proposed limiting usage of fireworks as well as a cleanup day on the eve of the celebrations to remove trash and other fire hazards in urban areas. At this time, most buildings in Kansas were wood frame, and the chance of accidental fires was a real threat. In 1915, newly appointed fire marshal Lewis T. Hussey adopted the Kansas City plan and started promoting its benefits in time for the July 4th holiday. Lewis Hussey grew up in Coffey County, Kansas, graduating from Burlington High School in 1888. His family moved to Osage County, where his father, Jerry, became register of deeds and Lewis served as deputy until 1893. Lewis eventually became city clerk and later mayor of Lyndon. As mayor, he led the way to the installation of a city water and sewer system, which had mixed reviews among the citizens of the town. He was also elected to serve as state representative from Osage County and also served as state oil inspector. During his civil service, Lewis pursued a career in insurance, establishing the Metropolitan Accident Association. He then joined others in organizing the Osage Fire Insurance Company in 1908. His experiences as a civil servant and in the fire insurance field made Lewis a perfect choice for Governor Arthur Capper to appoint him as state fire marshal in 1915. Capper had already started instituting portions of the safety measures of the Kansas City fire prevention plan, such as a statewide clean-up day in April, but Lewis was the perfect person to enforce what had begun. SOS recently accepted a $6,000 donation from CoBank and Lyon Coffey Electric Cooperative from a matching fund program through the bank. CoBank started accepted applications for its Sharing Success program on April 1, 2018. Sharing Success is an annual $3 million fund designed to match the contributions of CoBank customers to the charitable groups they support throughout rural America. Eligible CoBank customers were able to submit an application for the matching grants. 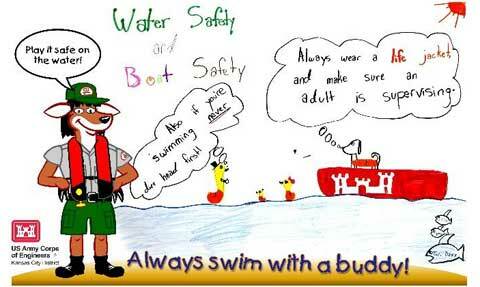 The Melvern Lake Corps of Engineers is inviting kids to show what they know about water safety in this year’s water safety poster contest. Kids ages 6 to 13 are welcome to join the fun and create a poster promoting water safety. Wear your life jacket: Why is it important to wear your life jacket or personal flotation device? Swim with a buddy: Why should you never swim alone? Boat safety: What can you do or what should you bring to be safe on a boat? Open division: What does water safety mean to you? Artists can enter more than one category, but only one poster per category. Posters can be created using pens, pencils, markers, colored pencils, paint, or crayons. Include name, age, category entering, and contact phone number on back of each poster. An 11 by 17-inch poster paper to use will be provided at the following locations – these locations are also the drop off areas of finished posters. If an 11 by 17-inch paper (preferably poster or cardstock type) is already available to youth, they are welcome to use that. Entries not on 11 by 17-inch paper will be excluded from the contest. Pick-up and drop-off locations: Lyndon Carnegie Library, Melvern City Hall, Osage City Public Library, Coffey County Library, Waverly and Lebo branches, and Reading City Hall. Finished posters are due by July 20. The entries will be judged on displaying correct water safety practices and reasons why, creativity, and clarity of the safety message being conveyed. WASHINGTON, D.C. – The U.S. Department of Agriculture has designated 10 counties in Kansas, including Osage County, as primary natural disaster areas due to losses and damages caused by a recent drought. The designated counties include Clay, Geary, Lyon, Pottawatomie, Shawnee, Coffey, Jackson, Osage, Riley, and Wabaunsee. Farmers and ranchers in the contiguous counties in Kansas also qualify for natural disaster assistance. Those counties are: Allen, Cloud, Greenwood, Nemaha, Anderson, Dickinson, Jefferson, Ottawa, Atchison, Douglas, Marshall, Washington, Brown, Franklin, Morris, Woodson, and Chase. Qualified farm operators in the designated areas eligible for the Farm Service Agency’s emergency loans, provided eligibility requirements are met. Farmers in eligible counties have eight months from the date of the declaration of May 10, 2018, to apply for loans to help cover part of their actual losses. FSA will consider each loan application on its own merits, taking into account the extent of losses, security available and repayment ability. FSA has a variety of programs, in addition to the EM loan program, to help eligible farmers recover from the impacts of this disaster. EMPORIA, Kan. – The United Way of the Flint Hills is inviting nonprofits located in Chase, Coffey, Greenwood, Lyon, Morris, Osage, and Woodson counties to apply for the organization’s emerging needs grants. Launched in 2015, the funding allows organizations to apply for grants up to $1,000 for new projects and new programs. LYNDON, Kan. – The 4th Judicial District nominating commission has selected Osage City lawyer Shannon Rush to fill a magistrate judge vacancy in Osage County, Kan. The commission conducted public interviews of nominees for the position May 9 in Lyndon. Five people had applied for the opening. Rush’s new position will be effective upon her swearing-in. She was in private practice with Coffman & Campbell, Burlington. The 4th Judicial District is composed of Osage, Anderson, Franklin and Coffey counties. The vacancy was created when former magistrate judge Taylor Wine was appointed district judge and chief judge of the 4th Judicial District. Multiple local fire departments worked to extinguish a house fire in rural Osage City Saturday morning. Around 10:28 a.m. Saturday, April 28, 2018, Osage County Fire District No. 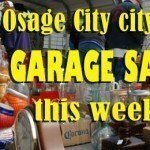 2, Osage City, OCFD No. 3, Melvern-Olivet, and OCFD No. 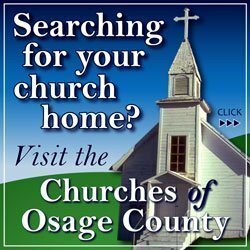 5, Lyndon-Vassar, were dispatched to 4204 W. 277th St., Osage City, for a structure fire. County land records list the owners as Janet and Patrick Walsh. A press release from OCFD No. 2 said that due to the rural location and nearest water refill site several miles away, additional departments were paged to assist with water shuttles. Fire department personnel were on the scene approximately five hours. The department reported there were no injuries, and fire and smoke damage was contained to the residential structure. The Osage County Appraiser’s Office values the home at $246,690; value of damaged contents was unknown. In the press release, OCFD No. 2 reminds everyone to have working smoke detectors in their home and check them frequently. Also have an escape plan, practice it, and be prepared to use it in the event of a fire. Agencies and departments on scene or assisting with the fire also included OCFD No. 6, Burlingame, OCFD No. 7, Quenemo, Coffey County Fire District 1 Station 6, Lebo, and Station 7, Waverly, Reading Benefit Fire District, Osage County Emergency Management, Osage County EMS, Osage County Sheriff’s Office, and Red Cross. LYNDON, Kan. – The 4th Judicial District Nominating Commission will convene May 9, 2018, to interview five nominees to fill a district magistrate judge vacancy in Osage County. The vacancy was created when the former magistrate, Taylor J. Wine, was appointed as district judge and chief judge of the 4th Judicial District. The commission will convene at 9 a.m. in the Osage County Courthouse, 717 Topeka Ave., Lyndon, Kan. Interviews are open to the public. The 4th Judicial District is composed of Osage, Anderson, Coffey, and Franklin counties. Jennifer Jolene Friend, non-attorney, Fredonia. Bryan K. Joy, attorney, Burlington. Robert Wayne Lattin, attorney, Independence. Elizabeth Lee Oliver, attorney, Baldwin City. Shannon D. Rush, attorney, Osage City. A nominee for district magistrate judge must be a graduate of a high school, a secondary school, or the equivalent; a resident of Osage County at the time of taking office and while holding office; and either a lawyer admitted to practice in Kansas, or able to pass an examination given by the Supreme Court to become certified within 18 months. Virginia worked as a court service officer, serving Osage, Franklin and Coffey counties, until her retirement in 2001. She was a member of the Overbrook United Methodist Church and enjoyed studying the Bible later in her life. The following information was compiled from records at the Osage County Courthouse March 12 through March 16, 2018. TOPEKA, Kan. – The 4th Judicial District Nominating Commission is seeking nominations to fill a district magistrate judge vacancy in Osage County. The former district magistrate judge, Taylor J. Wine, was appointed district judge and chief judge of the 4th Judicial District, which is composed of Anderson, Coffey, Franklin and Osage counties. Justice Eric S. Rosen, the Supreme Court departmental justice responsible for the 4th Judicial District, said nominees can apply or be nominated, but it must be on a nomination form and include the nominee’s signature. A nominee for district magistrate judge must be a graduate of a high school, a secondary school, or the equivalent; a resident of Osage County at the time of taking office and while holding office; and either a lawyer admitted to practice in Kansas, or able to pass an examination given by the Supreme Court and to become certified within 18 months.